"Friendly Festiva" is Guernsey's popular and award-winning churches community choir which celebrated its 30th anniversary year from July 2015 to June 2016. Established in 1985 by the Musical Director, Roy Sarre, the choir is a chorus of 70+ voices drawn from all the island churches and parishes. It is interdenominational, both in style and presentation and its Mission Statement is based on the Evangelical Alliance of London's Mission Statement "To offer praise to Almighty God". The choir has filled churches and concert halls in the Channel Islands and performed on both national and local television and radio. Closer to home, the choir has presented over 80 concerts at St James Concert Hall and attracts visitors from all over the world. Over the years many guest artists from the United Kingdom have come to share their gifts with the choir. The choir is associated with Christian Arts (Europe), the Evangelical Alliance, The Royal School of Church Music, The 'Churches Together in Guernsey' and also works with 'Churches Together in England'. 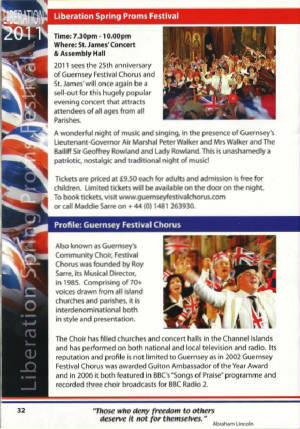 It is supported locally by Christian Arts Guernsey - set up by Roy and Maddie Sarre to facilitate the establishment of the choir and to promote Christian music and Christian artists in the Channel Islands. "Festiva" is not generally expected to be a fundraising group, instead it concentrates on spreading the gospel through music. However it does allow for an annual surplus of around £1,500 for various charities, and during its 30yr existence, the choir has raised about £50,000. In the past years, funds have been donated to the Guernsey Romanian Aid Appeal, The Bible Society in Swindon, Les Bourgs Hospice, Christain Aid and other local and international charities. At Christmas 2017, the selected charities were 'Wayaya' and 'The Tumaini Fund'. The choir always welcomes new members of all ages from 12 yrs upwards (N.B. Children must be accompanied by a relative). See our Join us tab for more details. Jose Paine became Co-director/Conductor from January 1st 2018. Both she and Roy are members of ABCD (Association of British Choral Directors) and attend the International Conference annually. Roy founded Festiva in July 1985, and has been MD throughout its 33 years. Jose has led the choir as Soprano soloist and Assistant MD and Deputy Conductor over 25yrs. Roy & Maddie Sarre, together with various members of the choir. We need to look after our male singers!